Pastoralism concerns a full 80% of the national herd. Through its mobility-based practices, it contributes to the development of forgotten or lightly populated territories. The pastoral system also plays a key role in feeding the population through the supply of milk and meat and in agricultural production through the provision of manure and animal traction. It helps to generate currency through the export of live cattle and products, such as leather and hides. A livestock farming country par excellence, Chad has a total of 94 million heads of cattle. Livestock farming is the second most significant source of income behind oil and contributes 53% of national GDP. It ensures the living of roughly 40% of the population and accounts for 30% of exports. It plays a considerable role in the reduction of poverty and improvement of food security. The financial value of the national herd is estimated at FCFA 1,000 billion, while the value of meat and milk production was estimated at FCFA 155 billion in 2012. Livestock farming thus stands as a major component of the national economy and remains one of the most productive sectors for which the country has high hopes in its drive to achieve sustainable economic and social development. The diversity of pastoral lifestyles and production is a strength for the country. This is illustrated in adapted races and the ancestral herding of cattle that promotes unique know-how making optimum use of a diverse set of natural resources. It is on the strength of this diversity that pastoral livestock farming and intensive livestock farming will be able to combine to contribute to national food security and the improvement in Chad’s balance of trade. To enhance this potential, pastoral infrastructure (market, processing, promotion and sales venues) and animal health issues need to be rethought in their entirety by integrating the sector of livestock farming and pastoralism. This is precisely what the Regional Sahel Pastoralism Support Project–Chad (PRAPS–Chad) intends to do. The four components of the PRAPS are interdependent and mutually beneficial, thus constituting strategic intervention focuses. In the first component – improvement of animal health – well cared-for animals (treated against diseases on a preventive or curative basis) will enhance the use of available pastoral resources (water and natural pastures). The second component – the development and management of pastoral resources – will serve to improve access to and management of these resources. As part of the third component, well-fattened animals will fetch higher prices through better organised trade, controlled through infrastructures designed to this end. The fourth component secures the livelihoods of farmers through economic interventions helping them to cope with weather- and disease-related events. Questions on access to essential production services for pastoral farmers as well as the rational and organised management of natural resources are more fully taken into account. Solutions are proposed in terms of access to quality veterinary medicines through the implementation of pastoral veterinary pharmacies and in terms of the diversification of water points, which will enable the use of pastures that remain inaccessible due to water shortages. Today, a large part if not all of the political initiatives on livestock farming development are supported by the PRAPS–Chad. The resources of the latter are not unlimited but will serve to implement the programme of the Head of State, Mr Idriss Déby Itno, who by focusing closely on rural development has sought to prioritise the economic and political importance of rural communities in Chad. 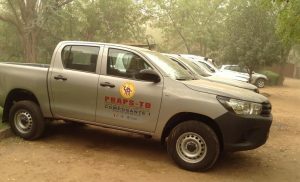 The contributions of the PRAPS–Chad are already widely visible on the ground. Over 5 million people, over one-third of them women, have directly benefited from the work of the programme, notably regarding the vaccination of animals against CBPP and PPR, both of which are priorities of Chad’s animal disease epidemiological surveillance and monitoring network, REPIMAT. With 7 million vaccine doses and a campaign against PPR consisting of 10 million vaccine doses, the mass vaccination campaigns thus far – two of which were against PPR – are the most appreciated actions by the beneficiaries, since CBPP and PPR alone cause more damage in ruminant farming than all of the other diseases monitored by REPIMAT. According to experts, the losses resulting from these two diseases amount to over FCFA 10 billion. But the strategy has now been ramped up and reported cases of CBPP have fallen sharply, by over 60% at the end of 2017. As part of the prevention and management of pastoral crises, a large quantity of cattle feed (2,850 tonnes of cake) has been acquired and is currently being distributed to save the lives of animals during the lean season, already at hand. The weather forecasts are extremely alarming this year, with expectations of a longer and more severe drought across the Sahel strip than in previous years. The distribution of this cattle feed will clearly soften the impact of the coming drought. The herd mobility practices of farmers serve to optimise the use of natural resources, which fluctuate in space (agro-ecological areas) and time (rainy and dry seasons). The growing pressure on land and resources calls for the design and implementation of pastoral development plans that facilitate access to water and pastures by clarifying rules as well as providing for infrastructure such as hydraulic works and transhumance routes. Consequently, a regionalised intervention strategy by the PRAPS–Chad, taking account of the extent of the 12 regions involved and the array of pastoral constraints in terms of limited resources, the number of achievable infrastructures and the interventions of other projects, was established on the basis of pastoral assessments. Some 82 kilometres of transhumance corridors have been rehabilitated through the repair and replacement of way markers. The social engineering process has been concluded for the rehabilitation of 40 wells, five pastoral stations and 15 ponds, along with 50 new wells, 40 ponds, 12 cattle markets and five exit posts, leading to the signature of the attendant labour and party agreements. The Ministry of Livestock Farming, the PRAPS, local authorities, livestock farmer associations and rural organisations have learned a number of lessons through these achievements. 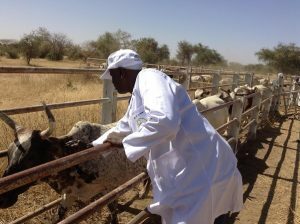 While substantial expectations remain, the PRAPS–Chad livestock farming project remains a source of hope for the development of pastoralism, the aim being for the country to take advantage of the benefits, such as cattle farming along increasingly rare and distant routes.